Question: Mark Twain wrote about the Jews: “The Egyptian, the Babylonian, and the Persian rose, filled the planet with sound and splendor, then faded to dream-stuff and passed away; the Greek and the Roman followed, and made a vast noise, and they are gone; other peoples have sprung up and held their torch high for a time, but it burned out, and they sit in twilight now, or have vanished. So what is the secret of the Jewish people that makes them immortal? Answer: This “secret” is the most revealed of all. It is written in the Torah that the Jewish people are eternal because they are intended to be a “Light for the nations” to bring humanity to the final goal of its development. Any other nation can disappear or change. No other nation has been preserved in the form in which it exited ancient Babylon. If we look at the map of Europe, we can see that there are no original nations that existed one or two thousand years ago. The modern nations are the result of mixing with Asian nations, who once immigrated to Europe in droves. Yet, the people of Israel remain the way they were. Only in the last hundred years did they begin to lose their external material form, but internally they remain the same. There is a program in the world that leads us to a specific development through a variety of stages. It can appear to us that this development isn’t always kind, but it follows certain laws. Historians, philosophers, and other scientists study these laws, although they can’t understand their inner essence. The wisdom of Kabbalah gives a full and clear explanation of what we need to do. The people of Israel must be this group that unites above their egoism. Each who feels the desire to reveal the Creator comes to this group. The people of Israel aren’t a biological nation; they are assembled from the representatives of all nations. However, they survived and went through the centuries because they were aspiring to the great goal that all of humanity should reach in six thousand years. Torah, Deuteronomy 11:24: Every place upon which the soles of your feet will tread, will be yours: from the desert and the Lebanon, from the river, the Euphrates River, and until the western sea, will be your boundary. The Torah speaks about all the qualities that are included within the so-called land of Israel, from the Nile to the Euphrates. Question: Is this also the physical borders of the land of Israel? Answer: I don’t think that there will be any physical borders left in the world. It is written that the land of Israel will extend to the whole world. It means that all of humanity will acquire spiritual qualities, and thus will exist in such conditions that are called the land of Israel. Land (Eretz) is a desire; Israel (Isra El, Yashar Kel) is the direction straight to the Creator. Thus, the upper force will be manifested in all our desires. And the borders specified in the Torah are given specifically to the source through which the upper force will come to the world and spread through it, over all desires. Question: What will happen after entering the land of Israel? Answer: The Torah speaks only about the first degree of correction. If we correct it, we will act correctly from that moment on. What Should We Do With Adversity? Question: What should I do if while studying the wisdom of Kabbalah I am going through a hard time with problems coming up from every direction? Answer: Because everything is sent to you from Above, from the Creator, from the system we are not fully part of, the problems are actually the way we are reminded that we don’t respect the unity in the group enough and the drawing of the Surrounding Light, the Light of the correction of our egoism. We must reach the feeling that the Creator’s greatness covers the distresses that are sent to us and we shouldn’t even think about fighting the distresses that are sent to us in any way other than asking for a greater feeling of the Creator’s greatness. At the same time, we have to systematically act against the problems that come up, just like everyone does in this world. Question: I am 75 years old, isn’t it too late to begin studying the wisdom of Kabbalah? Answer: Don’t consider age, enter into the method with your entire soul and you will see how quickly you will be able to do this. If a person is brought to the wisdom of Kabbalah and he makes an effort, he will necessarily attain what he must attain in this incarnation. Question: What book should one start with in studying the wisdom of Kabbalah? Answer: Take our Bnei Baruch Kabbalah Education Center courses; there you will learn about what book you should begin your studies with. Question: Is it possible to “play” too much when we play during the study of the wisdom of Kabbalah? Answer: No, it is impossible to play too much because your ego will bring you lower and lower every time. Question: How is it possible for me to develop an immense desire within me to study the practical wisdom of Kabbalah? Answer: This is only through the environment. This is mentioned in articles by Kabbalists. When you are in a group, you need to become inspired by the desires of the friends. We need to infect each other with a desire for spirituality. Question: What can be done about the fear of death? Answer: You are not the one who will die, rather it is your “animal”—the physical body. You are immortal. Question: Is it possible to discover spirituality without knowing the theory of the wisdom of Kabbalah at all, and then attain the wisdom of Kabbalah through sensations? Answer: It is possible. We attain the wisdom of Kabbalah through sensations. In other words, we attain the theory specifically through the practice. Question: Was Rabash writing about a physical group or a spiritual group? Answer: He was writing about a physical group. He gave me articles that I copied and distributed to all the rest of the students. It all started when I had to convey the first lesson to the students that I had brought to Rabash. I asked him what I should tell them. He sat on a bench in a park, took a sheet of paper from me, and wrote his first article. 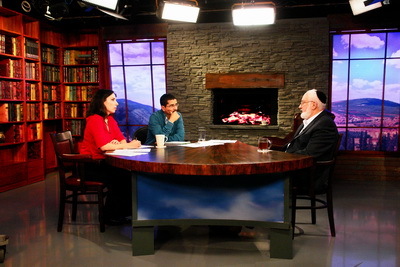 Question: What does it mean to study the wisdom of Kabbalah? Is this a living wisdom, a scientific experiment, knowledge, or a sensory attainment? Answer: It is a sensory attainment. Question: How does one work with the Sefirot practically? Answer: When you see that the Sefirot are the connection between you and others through which the Creator is revealed and this is how you bestow to Him, and through the Sefirot, He bestows to you, meaning the connection between friends, then you will know what the Sefirot are and how to work with them. Question: Soon it will be possible to give birth to children without the participation of an ovum. Experiments like this are being conducted on mice. According to research published in the journal Nature Communications, they have already succeeded in giving birth to healthy mice this way by “persuading” the sperm that it is fertilizing a regular ovum. One of the possibilities for the future is that normal cells from the human body combined with sperm cells can create a fetus. In other words, parents can be two men or one man from whom they take the cell and the sperm. Where will experiments like this lead? Answer: This will lead us to an understanding that our existence is from protein, a very primitive animal. It is possible to conduct experiments, but I don’t think that humanity will need to give birth this way because we could make our lives simpler, more successful and orderly without the investment of many resources in biological robotics. One way or another, the question about the meaning of life will arise for a person: What is he existing for? Is it to maintain particular roles and functions? Although it would be possible to create a society divided into different classes, from workers to the highest levels, transforming some people into servants, others into soldiers, and another group into cleaners,etc. What is the benefit from this? Will the class, which decides who will be created and how to dispose of those created by them, derive a benefit? I don’t believe that the program of creation will be able to advance this way because nature has its own program that we have not developed. Rather, it is what develops us! In any case we must realize the program of creation and attaining a unique, mutual, integral environment for all of humanity, and in this way discover the characteristic called the Creator. In this case, we can rise to the next level in which our bodies will no longer exist. There is no reason for performing experiments with cells. On the next level there will be other experiments on higher matter with higher properties, not on living matter. A state of infinite wholeness will be found there. I think we will reach this much more quickly than the partial success of biological experiments. Question: How can we bring everyone to the new state as quickly as possible? Answer: Only suffering will push humanity toward solving the problem. In the meantime, we are preparing the method. When people will ask themselves: “What is the benefit from this life? What is its meaning?” The fact that it was plagued by physical or mental suffering, due to their lack of inner fulfillment, they will turn to our method, which will have already been developed and can be offered in a comfortable form for every user. An Embryo: A Stranger Or One’s Own, From The Earth Or From Above? In the News (Science Daily): “People with more friends have higher pain tolerance, Oxford University researchers have found. My Comment: All of us are completely interconnected in a single system, so to the degree we maintain connections between people, we can also share both good and bad feelings. If we are connected in good relationships, unpleasant sensations completely disappear. If we take on concern for others in their place, then we necessarily free them from thoughts about themselves, from the ego, and they can feel the Creator. In the News (Wired): “Co-operation is a key component in human interaction and also, according to new research from the University of British Columbia, the spread of civilisation. Not because for any altruistic reason, though; instead it might be directly down to a fear of a vengeful god. My Comment: That is, religion or beliefs in an omniscient God as punishing and rewarding, obliges a person to behave more honestly due to fear of punishment and desire for reward. If not for our egoism, we would not respond to these demands. In general, if God did not exist, He would have had to be invented. Kabbalah comes from the desire to understand the meaning of life, as stated in part 2 of The Introduction to The Study of the Ten Sefirot. And that is why Kabbalah is intended only for those who really want to reveal this secret. What Do People Need God For? Question: What kind of a connection is there between the meaning of our existence and attaining the higher power? Answer: This is the most primal force of nature. It is higher specifically because it manages everything; that is, it is the force of bestowal and love, spreading around it everything that exists within it: energy and fulfillments. It intentionally created the force of reception in order to fill it and bring it to a special level of existence. The force of bestowal is perfect because it doesn’t need anyone. The force of reception that was created by it is limited and poor because it always lacks something and is not able to attain what it lacks by itself. Comment: People are used to imagining the higher power, the Creator, as some kind of personality with which we make an alliance and now accompanies us. It is difficult to perceive it simply in the form of a force, as something lifeless. Answer: Is it really difficult to imagine this? Even in our physical world there are many different forces that are unknown to us. So why is it so difficult for us to grasp the existence of an upper force? On the contrary, other than forces, nothing else exists. All I see around me are forces that are shaped within my perception, in the form of physical images that seem to exist: inanimate, vegetative, animate and human nature. But in principle, these are all appearances of the same force. Question: How can we develop a relationship with this force? Answer: This is the upper force. When we create a relationship with someone, the forces are used to zoom in or connect, to get closer, to create contact. In reality there is only one force and nothing more besides it. Today, even physics, a purely materialistic science, has come to this conclusion. Upon more in-depth investigation, the matter that we see disappears; it exists only in our perception. The whole world we feel is the product of our imagination. There are only forces affecting our brains, drawing a picture that seems to be standing in front of us. But all of this is the result of the work of forces, like the display on a computer screen. Answer: A person is just a receptive force. But this force is composed of various receptive forces that are linked together in some kind of relationship. Therefore, all people are separate from each other. The receptive force is the force of the desire to receive. A person is a desire to receive. But he has many desires for various fulfillments that are woven together. Each one has its own special combination typical of men or women, children or adults. But in fact there is only a desire to receive pleasure from all kinds of sources possible. Question: So what are we referring to when we talk about the Jewish people having a connection with the upper force? Answer: Abraham taught people how to achieve the goal of life, the general program of nature, if they have such a desire for it. It is possible if a person obtains the force of bestowal that is found above us. And it is possible to attain it on condition that we build relationships between us that are similar to the force of bestowal. For this, we need to reach love for others as we love ourselves, mutual love. To the degree that we begin to discover these forces of love, unity and mutual cooperation between us, within them we discover the power of bestowal. Question: If we create relationships of love and reciprocity between us, then do we discover the same upper force within them with which they say the Jewish people made an alliance? What is this higher power? Answer: This is the upper force of love and bestowal, a desire to do good for others through our force of love. People who have a connection with the upper force are called the “Jewish people,” Jews, because they understand that they are obliged to be united among themselves and between them and the upper force. The force of reception is given to us from birth. It is particularly very great among these people, so they are called a “stiff-necked people” (Exodus 34:9). But we understand that it is required only so that with its help we will discover the force of bestowal. The force of egoism burns within us and keeps us apart from each other. In this way it forces us to search for the force of bestowal and connection.